May 15 2015:.The wedding images taken at The Jupiter Civic Center in Jupiter, Florida. Here the bride and groom playfully dance on the beach. 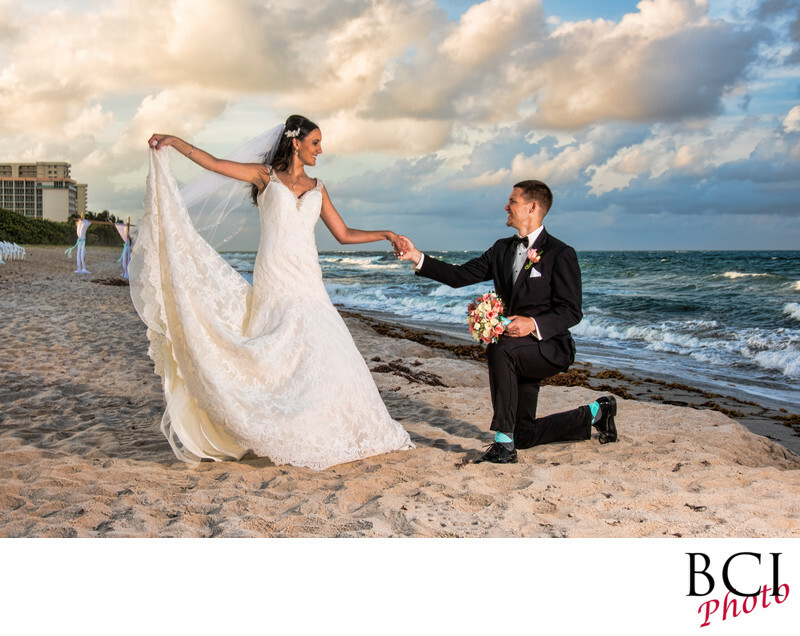 Highlighted by some amazing skies, which can be seen here because we have professionally lit the couple up using off camera portrait lighting which brings their light level up to match that of the clouds behind them allowing the camera to properly expose both for a truly magical rendition of this romantic beach wedding moment caputred in Jupiter. You can see their wedding ceremony arch in the background where mere minutes earlier, they couple tied the knot by the sea, in a wonderful beachfront wedding ceremony.